I experience sometimes the process mentioned above as someone who works with spatial data. I decided to make this process easier by copying data to RAM. And I have developed Speedy Layer plugin. By using this QGIS plugin you can transform a vector layer to Memory Layer (stored in RAM) and play on it. So you can perform tests without touching original data. One of the best feature is speed. Memory Layers are faster in analysis and rendering because they stored in RAM. Firstly open SpeedyLayer plugin and choose target layer from the combobox. It will list all attribute fields of the layer automatically. You can remove unneccessary fields if you wish. This wont change original layer’s fields. 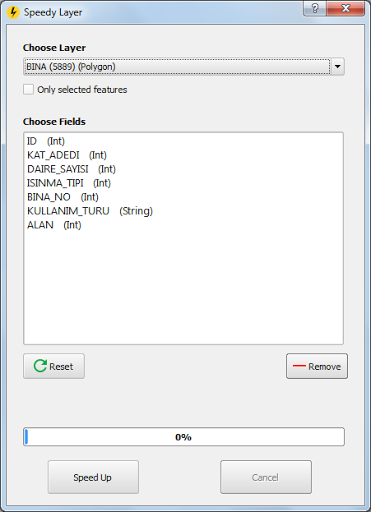 But unselected fields wont be in the output layer. If you remove a field by accident than click Reset button to list them again. After selecteing target layer and determining useful fields click Speed Up button to start the process. Note that if you want to work with selected features you can put tick to the ‘Only selected features’ option. After the transformation operation completed ‘memorized’ layer will be added to the QGIS canvas. Output layer is stored in RAM. So it will be gone in case of removing from the QGIS canvas or closing QGIS. If you want to keep it you can save/load to a file or a database. You can also you my another plugin Feature Loader for loading operation. If you dont select any attribute field, output memory layer will have only geometry data. This operation loads data to RAM so other applications that needs RAM could be affected. Also if the size of data is bigger than RAM, probably QGIS will crash. But I haven’t tested this situaiton. That is really interesting. Because Speedy Layer does not update geometry. It copies features from any vector layer to memory layer.